Hey! Hey! Hey! My fitness tour is still going strong :) I am pretty confident I will be able to at least make it to vacation time doing free, or discounted classes around town. Then I can make my final decision on what I want to stick with. The last two weeks have taught me that my fitness level has gone way down....I am not as strong as I thought I was. Maybe gone down isn't the right word. Maybe, more like, I'm nuts and had a skewed perception of my fitness level....maybe I was never as fit as I thought I was??? All these classes are giving me a dose of reality. 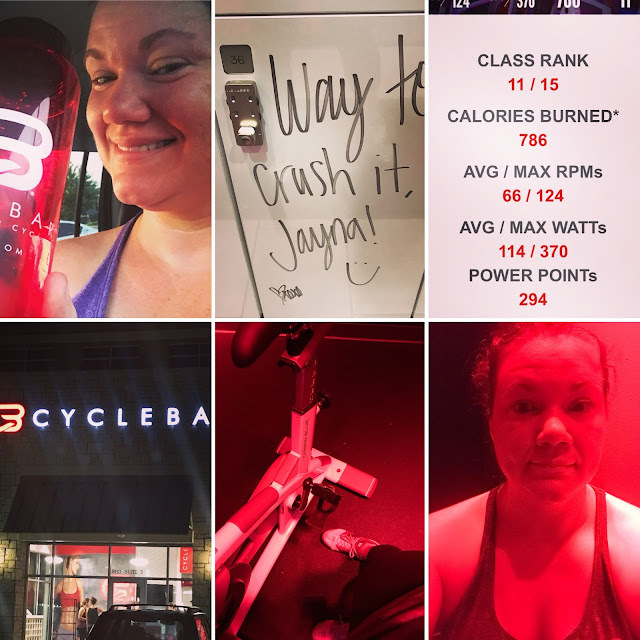 This week I started off strong with CycleBar. Now. I LOVE spin classes. My friend, Jeff, started teaching spin a million years ago, and I took my first spin class with him in 2011. He has always been my favorite instructor and I compare every other class to him. Every one. So, on a scale of 1-Jeff how did I like Cycle Bar...I'll admit, it was at an 8 or 9. Maybe if the instructor and I were friends outside of class I could have given her a Jeff rating??? Maybe??? I signed up for the free introductory class online Sunday evening and be-bopped my way there before sunrise on Monday. Not knowing what to expect I take my own spin shoes and a bottle of water. Forgot my towel because I always forget a towel. When I arrived I was shown where my cubby was and there were spin shoes available for me to use. THEY PROVIDE YOU WITH SPIN SHOES! They also gave me a water bottle and a locker. Everything was white and clean and I was scared to touch stuff. Have you seen the movie I Feel Pretty? It was like that place. And all I could think was "whatever I do. Do not fall off my bike!!" We go into the cycle room and there are just wall to wall bikes. Naturally I can't find my assigned bike and the front desk lady has to come help me. Hello! New girl in class! I find my bike and get it set up and class begins. The instructor looks like a DJ up front with her iPads to control the music and the leader board up front. She dances and is encouraging throughout the whole class. We do endurance rides for this workout. Ugh. I have no endurance. There is also a board up front that will pop up with every riders stats and what they are ranked in the class for that particular ride. Yikes!! I felt like I was giving it my all, muscles screaming, sweat dripping everywhere, and about to pass out during the class, then I would look at the board and be listed at 12/15. Doh! I did make it #5 once. I finished the class ranked #11. Not where my body thought I should be, but I wasn't last!! These people are animals. And no one appeared to be sweating. When class was done I wiped down my bike, mopped up my sweat, and went to my locker.....they had written a little note to me on my locker. Awwww.....Cyclebar was definitely fun if you like spin. The extra little touches made it really nice, and a lot different than any other cycle experience I have had before. I totally punked out and didn't do anything from Monday until today. #lazybones This morning my cousin, EB, and I met at Orangetheory. I have been excited about trying Orangetheory since they announced they were opening locations in Tulsa--A YEAR AGO! I was under a contract somewhere else when they opened and it just never worked out to try. We met there before the sun was up again and did our paperwork, met with a trainer and he walked us through everything. They asked us what our goals were...I explained that I would like to lose my 80lbs of baby weight from 11 years ago. It's still a goal! Side note: Don't eat quarter pounders with cheese 2x a day for 9 months. The baby will not weigh 80 pounds, but you will hold on to it for a long time. After all the formalities it was time to begin class. And guess what??? It was an endurance class....again!! I can't seem to get away from those. EB and I started out in the "weight room." Really it's just a small area to the side of the room. We did squats, and weights, and planks, and more squats....oh my! My muscles were burning, and I can't hold a plank to save my life. I have ZERO ab muscles or stability. I'm similar to a train wreck. Trying to get me to move my leg and opposite arm at the same time is asking for trouble. At one point we had to lunge and lift a weight over our head at the same time. It wasn't pretty. After what felt like forever and I thought we were almost done, the trainer has us switch with the other half of the room. Now the cardio portion begins. WTF? I thought all those lunges and planks were my cardio. OMG. So we go get on a row machine. Again. Having to do multiple moves at once. I only lost the handle bars twice. We row for 600 hours. I am certain class is almost over and my legs are jelly. I look at the board and the goal is to get in the orange zone and earn splat points. Ideally you want to earn 12 or more splat points. Y'all. In 6 hours of weights and rowing I had earned 2. I was convinced my monitor was broken. That can't be right. So, the trainer says times up on the rower. I'm thinking class is done and I can crawl out. Oh no!! Now we get on the treadmill! He has us do an endurance walk/run for 6 minutes. I haven't run in....lets just say a while. So I "powerwalk" on the treadmill at a 6 incline. I tried to set my speed. Apparently there is a learning curve for setting a treadmill. At one point I had my incline at a 9 and my speed at a 10. Then I couldn't get it to turn off. It was a disaster. EB was laughing at me. I'm sure the trainer thought I was a nut job. Finally I get everything right and continue on with my 6 minutes of torture. I couldn't feel my legs when I began. I was a complete pile of goo by the time this all ended. And of course sweaty, cause that's what I do. When class finally ended I managed to earn 7 splat points. And they told me I could come back so I must not have been that big of a disaster. I definitely loved it, and felt GREAT afterwards, after I got feeling in my body again. We leave in 2 weeks for a vacation. I'm going to keep trying out different things until then. I'll make my final decision after vacation, but Orangetheory is a top contender right now.